As educational practitioners and policymakers expand the range of student outcomes they assess, student perception surveys—particularly those targeting social-emotional learning—have grown in popularity. Despite excitement around the potential for measuring a wider array of important student outcomes, concerns about the validity of the inferences that might be drawn from student self-reports persist. One of the most ambitious attempts to incorporate student perception surveys into a larger assessment framework has occurred through CORE—a consortium of school districts in California. 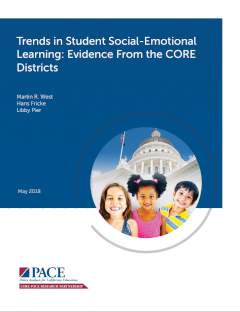 Pulling from CORE’s data and their use within these districts, we summarize the evidence for validity and reliability of CORE’s student-report surveys on social-emotional learning through a pragmatic approach. Social-emotional learning refers to the beliefs, attitudes, personality traits, and behaviors that students need to succeed in school and life. Our study looks closely at ten “outlier schools” in California’s CORE districts whose students report strong social-emotional learning outcomes compared to other, similar middle schools. Note: See March 2019 report for updates data and analysis from this March 2018 version. High quality instruction delivered by effective teachers is the key to student success. Hiring, developing and retaining good teachers are therefore the most important tasks of our public schools. The tasks of teacher recruitment and retention have traditionally been delegated to the human resource department within school districts, but leaving these critical responsibilities to a single office is no longer sufficient. The ability to find, support, and keep good teachers is a community challenge, which demands innovative solutions collaboratively developed by diverse stakeholders. Summer learning loss contributes significantly to the achievement gap between low income students and their more affluent peers. That makes high quality summer learning programs a smart investment for school districts concerned about success for all students. Such investments have become easier thanks to the flexibility built into the Local Control Funding Formula (LCFF). Despite California’s great wealth, child poverty places a drag on the state’s educational performance. Disadvantaged children—including English learners, foster children, and the poor—do not receive the educational attention and services that they require to be successful. Although California’s Local Control Funding Formula recognizes this challenge, schools and districts have struggled to identify effective solutions to educate disadvantaged children.